I think our feet are slowly starting to feel the effects of having just done four major theme parks in as many days. The fun will continue today as we make it five-in-a-row. We’ll go to a water park tomorrow to relax a bit but for today at least, it’s the big one on the agenda - Disney’s Magic Kingdom. Since we’ll probably do this one at least twice, we won’t bother about trying to see everything today and we’ll try to take our time. We had planned on visiting our favourite breakfast haunt but we couldn’t spot it along the soulless and infamous highway 192 - at least not until we’d actually parked outside of the Golden Coral, where we’d resigned to having breakfast instead. Since we’d already parked the car, we decided to give the Golden Coral a shot after all and were pleasantly surprised. We’ve been to this restaurant many times in the past but this is the first time we’ve been there for breakfast and I must say I’m tempted to supplant the Waffle House as our primary haunt for breakfast from now on. Not only was it cheaper but the buffet food was good, plentiful and more varied. We’ll probably go there again tomorrow. As has been the case all week, many of the car park areas at the Magic Kingdom were completely devoid of cars, leaving us with the best of both worlds in that it was very good weather but not too many people to clog up the queues into the attractions. After parking the car, the choice was either the ferry or the monorail over to the entrance turnstiles and since we didn’t have to fold the buggies for the monorail, this was our chosen method of transportation. We actually weren’t sure if this was also the case for the ferry but we went with the monorail anyway since the kids had seen it whizzing past several times already and it was nice to let them experience it. At the turnstiles, there was a problem with out tickets, which steadfastly refused to let us in even after numerous attempts. In the end, we switched tickets (the fingerprints are linked to the tickets) to see if that would help - which it did strangely enough. The guy at the turnstile said we must have switched the tickets not realising but I’m pretty sure we had them the right way around when we were initially fingerprinted. Safely in the park, we decided to hop onto the train to make our way to Toon Town. Irritatingly, we had to fold the buggies and carry everything before they’d let us on but it was early enough in the day that we weren’t yet that exhausted from the heat for it to be a problem. We went to Toon Town specifically for photos with Mickey but we let the kids play around in some of the play areas for a bit first. They did get a bit wet in one of the areas that had some water features but this soon dried out in the heat of the day. I took Joey on the small roller coaster before we eventually got in line for the photo-shoot with Mickey. As luck would have it, Minnie was also there with him (which apparently isn’t always the case) and we did get a few good shots from the exercise. The kids also enjoyed wandering around Mickey’s & Minnie’s houses afterwards. With the weather and humidity being what it has been this past week here in Orlando, we’ve made sure to keep the kids topped up with fluids throughout the day and it was at this point that it dawned on us that we’d left the kids’ juice drinking bottles back at the house. Thinking fast, Sandy went into one of the very very many shops dotted around the park (these parks are essentially huge retail outlets) and picked up a couple of drinking cups. I think the heat had gotten to her since the ones she found were not water tight and thus not suitable for purpose. I ended up taken them back to exchange them for something more suitable - not exactly suitable but at least more suitable. Before leaving Toon Town, we went into another photo-shoot opportunity with three of the castle’s princesses, one of which was the same princess we’d had photos taken with yesterday at EPCOT. We spent the next half an hour wandering slightly aimlessly around the park a bit and really not knowing where we were going but all the time getting progressively baked in the hot mid-day sun. We found a little enclave where there was a princess telling the story of Beauty and the Beast (apparently with the aid of a few audience members that had been seconded onto the stage and dressed in costumes for the parts) so we hung out there for a short while. Unfortunately, I’d hung my camera on the back of one of the buggies and it was just enough to topple it over. The new and very expensive camera survived but the lens now creaks a bit when zooming back and forth. It still works but there’s now clearly something not right with its innards. We asked a park attendant where the best place was to take the kids and were pointed in the direction of Fantasyland so we set off in that direction. 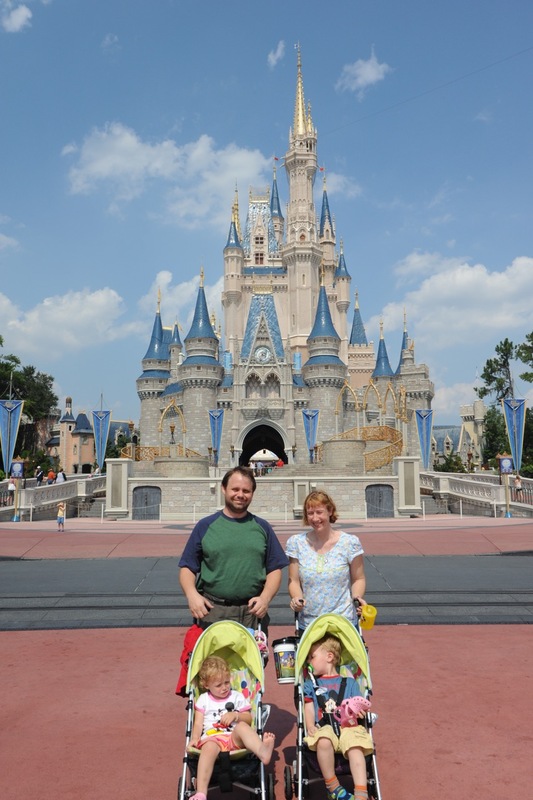 We had high hopes of the kids taking a nap but Jennifer in particular was not playing along so we packed in a few attractions for a bit. ￼We did the Tea Party first and then the Jumbo Flying Elephants (which took the better part of half an hour despite the posted ten minute wait time) before moving on to It’s a Small World and then finally the Mickey’s Philharmagic 3D attraction. Again, it was Joey that was less impressed with the 3D attraction. The heat of the day was pressing down on us by now so we took shelter under Cinderella’s Castle whilst the parade was snaking its way through the park. We did try a vantage point to watch the parade but neither of the kids seemed particularly interested. Joey eventually fell asleep under the castle but Jennifer was being stubborn again and just wouldn’t nod off. After a brief rest-bite from the piercing sun, we set off towards Tomorrowland. The wait times here were pretty good with most attractions taking people straight in with no waiting at all. Many of the attractions here were not here the last time we visited. We did the Buzz Lightyear Space Ranger Spin ride (which Sandy later repeated with Joey alone) and the Tomorrowland Transit Authority people mover. Buzz Lightyear was out having photos done so we got in line for a few snaps with him. We also did the Disney’s Carousel of Progress attraction, which we’d not done previously. It was a bit lame in the end and Joey got impatient to leave before it was over and done with. The last attraction we did was the Monsters Inc. Laugh Floor, which turned out to be one of the best of the day. This was similar to the Chat with Crush attraction at EPCOT in that there were animated characters on the screen in the auditorium that interacted with the crowd. The idea was that the characters were acts in a comedy club and they had to fill the canister with enough laughter to open the exit doors. It was good fun and very cleverly done. We’d already made a character dining reservation over a Crystal Palace (this was done before we’d left England some weeks ago) and our reservation time was approaching so we headed over the Main Street U.S.A. to check in. As we made our way past Cinderella’s Castle, there was a show with Mickey, Minnie and some other cast (including that same princess again - she gets about a bit) all performing a sing and dance number in front of the castle. This time our meal was buffet-style and although the food was better in my opinion, Sandy felt that yesterday’s Garden Grill restaurant at EPCOT was better because it was quieter. Either way, the kids loved the characters (Pooh, Twiglet & Tiger) that did the rounds a few times. We stopped in to some of the shops along Main Street before finally leaving the park and taking the monorail back to the car parks again. It was a fun day but we saw probably less than half the park altogether so we’ll come back here again before we leave the Orlando area.